This week's Time Out New York highlights Vlada Lounge (331 West 51st Street between Eighth and Ninth Avenues), a new bar by Vlada von Shats, owner of the Russian Samovar. Like Eastern Bloc (505 East Sixth Street at Avenue A), which opened last December, Vlada Lounge also features a Soviet theme. 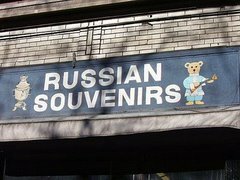 Unlike Eastern Bloc, it is authentic. 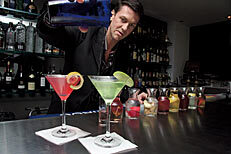 The drink list features no less than 15 sorts of infused vodka, sure to be a crowd pleaser. The place is really boring and dull. A waste of a Friday night. I'll be there this Saturday. I expect good music to dance too and great atmosphere. Vlada's design is cool and modern and a lot of hot guys go there; I met my very hot boyfriend there. About Slavs of New York!